Today's post, as well as yesterday's, is a bit different than what you'll normally see around here. Basically I'm sharing the notes I made while listening to Wilson's lectures and you can tell. The format is different but I still find the notes worth posting. Glean what you will. The topic of confessing sin comes up in every single Narnia book. The good guys in Narnia are genuinely honest and the bad guys are fundamentally dishonest. In this lecture, Wilson discusses real honesty, phony honesty and The Temptation to Confess the Sins of Others. “You met the witch?” Aslan growled. “I mean, I woke her.” Digory admits. He wanted to tell Aslan the story leaving his sin and folly out of it but Aslan does not permit this. Aslan does not demand perfection, but he does demand honesty about our imperfections. Aslan also confronts Polly asking if she has forgiven Digory (after an admission/confession of his fault to Polly) for preventing her from stopping the ringing of the bell. Forgiveness also needed to be extended. But first sins had to be confessed. 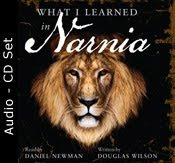 The Lion, the Witch and the Wardrobe – Edmund doesn’t tell Peter and Susan the truth about having entered the wardrobe. “I was just pretending” he tells them when they press him for an answer. The Professor tells Peter and Susan that they have three options – to believe that Lucy is crazy, to believe she is telling a lie or to believe she is telling the truth. C.S. Lewis also argued that you would have to make the same decision about Jesus Christ being the son of God – either He is lying, crazy or He is telling the truth. But you cannot just settle on the idea that Jesus is “good” unless you believe His claims. Upon entering into Narnia Peter apologies to Lucy for not believing her. He confessed his sin, and she forgave him. Again forgiveness follows confession. The Horse and His Boy – Shasta and Aravis are racing to the hermit’s enclosure and Aslan is chasing them to make them go faster. Aslan chases Aravis and swipes at her back with his claws, cutting her back. Shasta leaps off of his talking horse, Bree, and turns to confront the lion. Prince Caspian – Aslan appears to Lucy alone to give her directions for the group to follow. Lucy tries to share Aslan's directions with the others but instead goes along with the crowd - in the wrong direction and under the leadership of Peter. Aslan then later appears to the whole group through Lucy. Susan apologies to Lucy for not believing and confesses that in her heart she had believed Lucy but chose not to be obedient. Peter confesses immediately: “I’ve been leading them wrong.” Aslan forgives him instantly. When you blame someone else in Narnia, Aslan growls at you. But when you simply confess your sin like Peter does, Aslan responds, “My dear son.” He accepts the apology. There is no problem when honesty is involved. Voyage of the Dawn Treader – Caspian wants to abdicate and go to the end of the world. Everyone tells him that he cannot do that. Caspians knows that they are right but loses his temper anyway. Aslan appears to Caspian in his cabin to address him. Caspian confesses, “I might as well have behaved decently” for all the good that his lack of temper did for him. The Silver Chair – Eustace and Jill get away from the Experiment House and find themselves in Narnia. They are on the edge of a huge precipice but Jill is showing off and showing contempt. Eustace tries to keep her from falling off but falls off himself. Jill's response is to say “Well, don’t blame me! It's not my fault he fell off the cliff.” But then Aslan addresses her, asking her how Eustace fell off the cliff. She admits that she was showing off. “That is a very good answer.” He accepts her response as truth and tells her not to do that anymore. The Last Battle – Puzzle sees Tash go by and sees how wicked Tash is. “I see now,” said Puzzle, “that I really have been a very bad donkey.” It becomes clear to him that he should have stood up to Shift. Clear acknowledgment of sins. The Magician's Nephew - Before confessing honestly to waking up the witch, Digory asks Jill for help to help him with the witch who is loose in London. She refuses to help until he apologizes for his actions. This is the way our minds work. We don’t like taking blame. Aslan though demands honesty -- as painful as it may be. This demonstrates that Edmund was interested in saying the right words but when he doesn’t get the automatic and specific response that he is after, his apology because imperfect and selfish. It isn’t real. Not then. Not at that time. He was not confessing honestly. Prince Caspian - Lucy is telling Aslan that the others did not believe her when she told them she had seen the Lion and received direction from him. Aslan lets forth a sound of a growl. “But she –“ “But he –“ receives the response of a growl. Aslan insists that we deal with our own sins and not try to pin our lack of correct behavior on the decisions, behaviors or beliefs of others. We will be held accountable for our own obedience or disobedience.